Despite Syria’s repeated violations of Security Council Resolution 2118, including use of chemical weapons, and the public and official recognition of these violations, the Obama administration continues to avoid any enforcement or any direct action against the Assad regime, out of policy considerations and the desire to limit US military involvement in the Syrian civil war. This ongoing policy, however, has negative implications for the United States and its ability to wield influence in Syria;; its status vis-à-vis other powers, especially Russia; and the United States’ standing among its allies as a partner that keeps its commitments and does not flinch from using force to do so. As such, the current US administration, and certainly the next one, would do well to examine alternatives to end the Syrian chemical weapons affair, as well as to promote other strategic goals. In the summer of 2013, more than one thousand civilians in a suburb of Damascus were murdered in an attack by the Syrian military that apparently included use of the chemical agent sarin. Soon after, the United States issued an ultimatum, declaring that the Assad regime could well be subject to attack if it did not refrain from using chemical weapons. Russian intervention helped reach an agreement (Security Council Resolution 2118) on the dismantlement of Syria’s chemical weapons arsenal and Syria’s accession to the Chemical Weapons Convention, and consequently the United States refrained from carrying out its threat of attack. The agreed dismantlement of the chemical weapons that were declared by Syria was completed over the course of 2014 in an international effort. Some one thousand tons of chemical warfare agents, as well as munitions, precursors, and production infrastructures were destroyed. The process was an extraordinary strategic achievement: the threat of the use of military force and coordinated political moves by two powers – the United States and Russia – resulted in the elimination of the Assad regime’s ability to employ chemical weapons on a large scale. This achievement was especially noteworthy considering the prospects of military alternatives and the inevitable costs that would be incurred. Yet notwithstanding the impressive accomplishment of this military-political move, the solution included several significant lapses that were apparent from the outset. Regarding potential, Syria was left with undeclared production and munitions capabilities; at the operational level, reports on recurring use of chemical weapons by the Syrian regime continued and even increased;1 at the normative level, Bashar Assad remains in power, despite having violated an international convention to which Syria is a party and having used chemical weapons against his own civilians, whom he continues to butcher with other means, while an increasing number of actors have come to see him as part of the solution; and, finally, at the strategiclevel, a problematic precedent was set by the United States, when it failed to enforce its ultimatum once the red line it had drawn was blatantly crossed. Such a precedent has serious ramifications for the image and reputation of the United States as a deterrent power, in both the Middle East and elsewhere, e.g., Europe and Asia-Pacific. Since the start of this chapter in early 2013, the US administration has issued carefully worded statements, and to retain freedom of decision and action, it has studiously avoided any unequivocal confirmation of reports that the Assad regime was using chemical weapons. 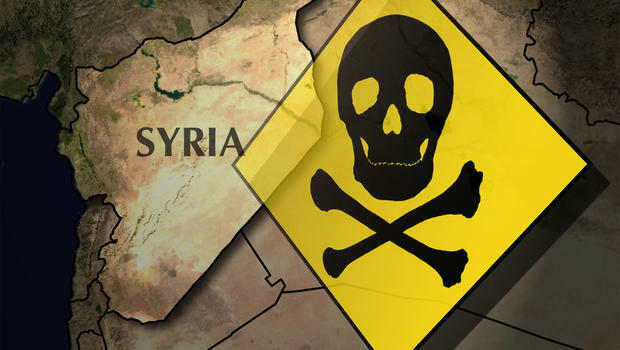 In early June 2016, the State Department issued a report on terrorism, which stated: “The United States cannot certify that Syria is in compliance with its obligations under the Chemical Weapons Convention (CWC). The United States assesses that Syria has used chemical weapons systematically and repeatedly…In addition, the United States assesses that Syria did not declare all the elements of its chemical weapons program…and that Syria may retain chemical weapons as defined by the CWC.”2 However, a White House statement of August 24, 2016, was more definitive: “It is nowimpossible to deny that the Syrian regime has repeatedly used industrial chlorine as a weapon against its own people in violation of the Chemical Weapons Convention and UN Security Council Resolution 2118…The United States will work with our international partners to seek accountability through appropriate diplomatic mechanisms.”3 A March 14, 2016 Syrian American Medical Society report mentions 161 documented chemical weapons attacks in Syria since 2015, most of them involving chlorine. In addition, on September 11, 2016, in presenting the ceasefire agreement in Geneva on the eve of Eid el-Adha, the Feast of the Sacrifice, an agreement that has already collapsed, Secretary of State John Kerry explicitly noted toxic gas attacks as part of the saga of suffering in Syria. Despite these violations and the public and official recognition of these violations, the Obama administration continues to avoid any enforcement against the Assad regime or any direct action against it, out of policy considerations and its desire to limit US military involvement in the Syrian civil war. The administration claims that any military involvement would lead to boots on the ground, and stresses the unreasonable cost of enforcing no-fly zones in Syria’s skies. This policy can be expected to continue until the end of Obama’s term in office. This ongoing policy, however, has negative implications for the United States and its ability to wield influence in Syria; its ability to force the Assad regime to uphold agreements, including ceasefire agreements; its status vis-à-vis other powers, especially Russia, in Syria and elsewhere, beyond the Middle East (against a background of rising European worries about Russia); and the United States’ standing and image among its allies as a partner that keeps its commitments and does not flinch from using force to do so. a. Demand that Assad’s regime and Russia stop their intentional targeting of civilians, with emphasis on the use of chemical weapons. b. Continue to gather evidence and document the use of chemical weapons by the Assad regime, and demand and hold challenge inspections of sites in Syria implicated in the production, storage, and use of chemical weapons. c. Reexamine its stance on Bashar Assad’s continued role as ruler in Syria, through insistence on putting him on international trial for crimes against humanity, including the use of chemical weapons against civilians. Such an act would have tremendous moral and ethical value even if the process would be drawn out and possibly delayed. d. Consider attacking Assad’s forces, preferably in stages, in order to demonstrate US intentions and what might happen unless Assad changes his ways, first in destroying helicopters used to attack civilians, then the entire array, and then more broadly the entire Syrian air force; prepare to attack Assad’s forces’ aerial defense system, which limits the United States aerial freedom of action; and attack the chemical weapons infrastructures and launching capabilities and facilities, when located. This must be done in an appropriate context, such as in response to another instance of the Assad regime using chemical weapons, intentionally targeting civilians, and refusing to comply with challenge inspections, and whenever there is risk to US forces in the theater. Such actions will make it possible to strengthen the position of the United States and its partners in the region, by applying pressure on the Assad regime to respond to international demands. Such actions can also result in strategic, normative, and humanitarian benefits, and will illustrate the credibility of US threats and a US willingness to use force over time to uphold norms and further its policy goals (beyond causing direct harm to its enemies, such as the Islamic State and al-Qaeda) as a message with strategic importance for all US theaters of competition with rivals and enemies. It will strengthen the political bargaining position of the United States and its allies in a diplomatic effort to end the war in Syria, with regard to both Assad and Russia; represent a clear signal to Assad and his regime and undercut his alternatives to a ceasefire; impose strategic and economic costs on the Assad regime and its supporters (Iran and Hezbollah, on the one hand, and Russia, on the other); and demonstrate to Russia that not only rebels supported by the United States are vulnerable to damage from the air. The United States must act with care so that its forces are not exposed to an effective response of the part of the Assad regime and its partners. This aerial operation does not require a significant military investment, compared to the resources currently invested in fighting the Islamic State. a. Israel must continue to avoid involvement in the Syrian civil war, while continuing to enforce the red lines it has drawn: defending its citizens, sovereignty, and forces against attacks, and preventing the smuggling of advanced weapon systems to Hezbollah, and the transfer of chemical weapons to terrorist elements. b. As in the past, Israel must support the intelligence efforts of the United States and the West to establish further evidence of Syria’s maintenance and use of chemical weapons. c. Israel can help the United States put the suggested methods of action into practice. d. Furthermore, Israel must make its moral and political voice heard to reduce the harm to Syrian civilians. At the same time, it must continue to provide humanitarian aid to the Syrian population residing in the Golan Heights close to the Israeli border. What used to be the Syrian Arab Republic presents the international community with a range of challenges that underlie the vast human disaster in the area and destabilize the regional and global order: the Islamic State, the civil war, widespread destruction, famine, refugees and displaced people, and regional and superpower struggles. None of these is sufficient reason for the United States to desist from promoting a better ending, in both normative and practical terms, to the Syrian chemical weapons affair, and in face of the rampant death and destruction, resume its leadership role. 1While reports from Syria state that most of the casualties are from conventional rather than chemical weapons, in the future the issue of consciousness of the use of such weapons and their high degree of suitability to terrorism should be stressed. BHO & Kerry are too busy with dangerous buildings in Judea and Samaria so don’t expect them to do anything about the catastrophe in Syria.